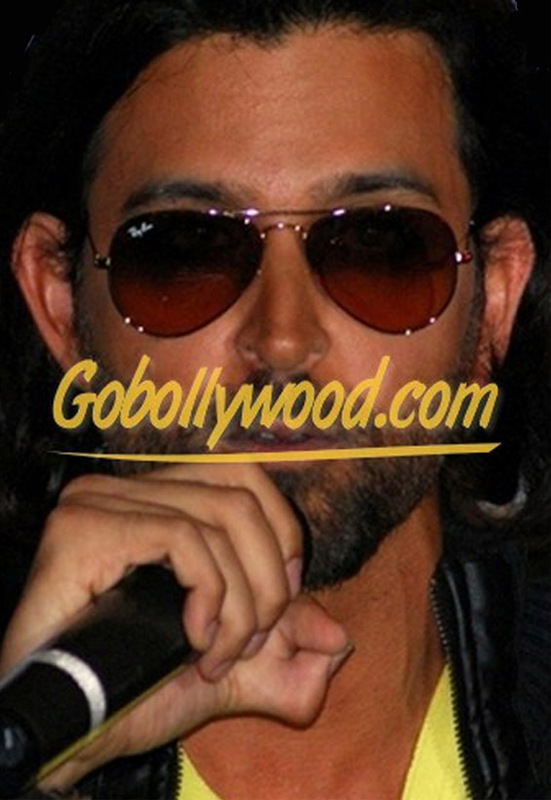 HRITHIK ROSHAN'S HANDS - About the double thumb of his right hand, now at Madame Tussauds! Hrithik Roshan has made it! The Bollywood star with the double thumb on his right hand will later this month be featured at .... Madama Tussauds in London!! Amitabh Bachchan was the first Bollywood actor to enter the Madame Tussauds museum, followed by: Aishwarya Rai, Shahrukh Khan and Salman Khan. Now the latest addition to the museum will be the 'The Greek God': Krish, Hrithik Roshan. "Whilst giving no details away, we’re promising the end result will be one of its most daring figures ever and that Hrithik’s fans will be delighted." But the video below shows how his left hand was plaster casted... ...no doubt that the Madame Tussauds crew did not forget to capture his right hand as well - so it must be because of his extra thumb! 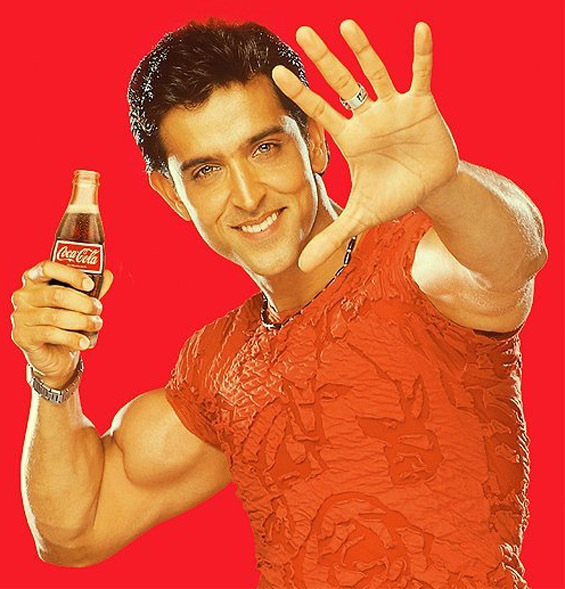 Re: HRITHIK ROSHAN'S HANDS - About the double thumb of his right hand, now at Madame Tussauds! Another example from the collection Hrithik Roshan "double-thumb tribute" (including 11 high quality pictures of his double thumb). Looks like sometimes his 'third thumb' was photoshopped away - because it should have been visible behind this coca-cola bottle...! Whenever one looks at someone's palm, the first question one should ask is: how is this hand/palm unusual form the "average hand/palm"? Focusing on this question will allow the reader to pick out what the actual "specifics" are and not rely or lame generalities! Remember, when someone shows you their hand, they are looking for something specific to them not general junk like: you are quite imaginative! 1. The average angle of the thumb i.e. angle with the Jupiter finger is about 45 degrees. The greater the angle, the more independent, freedom-loving and generous the person. In extreme cases you may see (rarely) an angle of 90 degrees.. This person (Roshan --- who is he anyway?) has an angle of the thumb that is greater than 90 degrees. This is incredibly unusual!!!! So all the qualities mentioned above are present at AN EXTREMELY RARE amount/degree!!! 2. Head line traverses the entire palm from one end to another. This is another very unusual sign and shows (potentially) a great intellect. This is one smart kid! 3. Fingers are knotted and the bases of all fingers "waisted" (not wasted!!!). This shows an individual whose love of learning and curiosity is at an extreme! This is once again a very strong sign and shows someone who is very analytical and has a very active mind. Once you have read about 10,000 hands you will have a very clear idea of what is normal and abnormal in palmistry. Both from a perspective of lines and shapes of hands and fingers. Yes, folks, palmistry is BOTH a body of knowledge and a SKILL!!! Just like you don't learn swimming by reading a book, you will not learn to be a skilled palmist by reading a book either. The good news is that the more hands you read the greater your skill will become! A classical example of a person who got turned his challenges, miseries and curses into friends and living his Life Purpose successfully. The way to complete satisfaction in your work lies in learning to turn your challenges, miseries and curses into friend. This is the secret. He has done and proved this. You cannot prosper without your coming to terms with your challenges. He could not speak normally in childhood, he could not even stand erectly due to pain in the back and he suffered rejection too. Thumb individualizes a person. He has a cleft thumb and that is only on half of the will part only. In the nature’s plan on the left hand Nature provided him a good handsome big size thumb which is set apart too from the palm. These qualities make a large angle showing the optimal huge territory and more than sufficient persistent power to be successful with generosity in nature. The logic part of the right hand thumb is double strong. He could very well understand his father’s guidance help and support and motivational talks. These persons auto suggest and motivate themselves. That part also guided him in decision-making. This all made him to understand the value of a self determined person. Unusual double-like cleft thumb on his right hand made him extra ordinary strong willed person. The fine and very much developed lower section of the thumb i.e. the mount of Venus giving him sufficient zeal urge energy to participate in career activities. The spaces between the fingers denote he is prone to add value to him hence making him more attractive and valuable even inevitable, interested in continuously self improvement. The longer finger of Apollo induces him to pursue to be famous to be in lime light. It also shows presence of good quantity of masculine testosterone hormones so much of his children will be male. He has two male children. However, earlier in his childhood he was quiet and sensitive as the consequence due to this abnormal thumb and he never felt normal. He always felt abnormal. He always felt that he did not fit in. But now as a successful adult he was no longer afraid to show his rather remarkable thumb! This became his hallmark. He has long deep Head Line on both the palms of the hands. This shows he can and devote his mental powers to a great extent. This is a gift on his palms that indicates that the person's mind works like a super computer and that he is able to collect or huge amounts of data quickly or do parallel process efficiently. He is the grand synthesizer. He needs a job that is big, complicated and important. This gives the capacity to solve really big complex, complication problems and provide solutions. It is not necessary that this line would be found on the palms of famous people only. I believe this is a gift mark and could be found on any body’s palm, indicator of a brilliant, analytical mind, capable of solving tough real life problems. He has done so. He is a problem solver and extremely busy person. The Head Line is very long, so such persons, when being true to themselves and honoring this gift marking, spends a lot of time thinking, planning, working with solutions, wanting to share their solutions and ideas with others. This is what they are designed to do. He is an ideal for many. Hard labor and persistent determination brought him success. He could rightly avail the opportunities presented before him. He is a creator and true to self. Longer pinkie gives great understanding powers with self and others with closeness. Self awareness helped him to be able to be creative. Life Line attached with Head Line gave sense of safety security cautious nature to establish relationship with family group or society. His middle finger denotes good focus on his aim. Sensitive pads on finger tips make him sensitive, helpful, liberal, sensible and of compassionate in nature. He is not food minded. He more dwells in the mental and creative world with a curious and inquiring mind. He was born on 10th January, 1974 to a filmy family, now he is a brand unto himself. He is not a hypocrite either. He is a complete gentleman and will continue to rise. With an enticing combination of star quality he skyrocketed to fame. His twinkling green eyes, winsome smile, and a lean, chiseled body found a huge fan following. 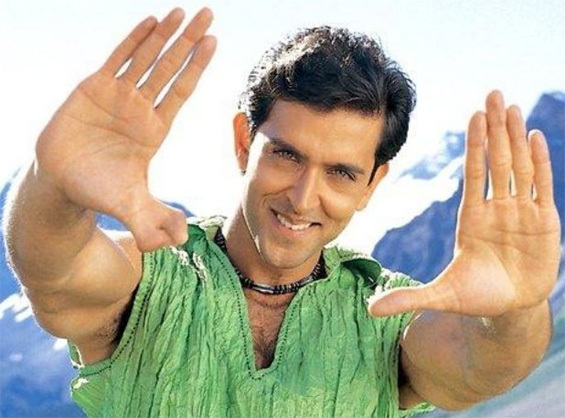 In Hrithik Roshan's Palm the thumb is low set, angle of thumb to Jupitor Finger is a little over 90 degrees, Mercury finger is quite long, Mount of Venus is also above average, palm skin appears smooth and he looks to be combination of Saturn and Mercury Mount and hence these two mounts qualities should be prominent in his nature. The above are the characteristic which are not often found in anyone person's palm but yes I have never found any person having angle of thumb with Index Finger less than 70 degrees and I often get to see this angle 80 to 90 degrees with the Index Finger. I have seen men having low set thumb but in this case Hrithik has the thumb very low set which is unusual. All the important mounts lie above that invisble line which is drawn from the upper tip of the thumb edge right across to the palm to the other end. Also he has a squarish palm. So this person does not require prominent fate or sun line for success. The other things ensures he will be financially well off. I see a dim Sun Line from just above the head line in the right palm so his major success in life is yet to come. From here he can only go upwards. Sorry, I can not confirm your observation regarding the length of his head line (nor your interpretation). Because I think the photos below indicate that in both of his hands the head line doesn't cross the full palm. By the way, I have multiple sources of evidence available which indicate that a long head line (especially when it crosses the full palm - which is usually recognized as a Sydney line) does not correlate with high inteligence. Sydney lines (= head lines which cross the full palm) are much more often observed in the hands of people with mental retardation (higher occurences have been reported for e.g. Down syndrome and fragile X-syndrome which are known as the two most common causes of mental retardation). Martijn (admin) wrote: By the way, I have multiple sources of evidence available which indicate that a long head line (especially when it crosses the full palm - which is usually recognized as a Sydney line) does not correlate with high inteligence. Thanks for raising this point Martijn. I had intended to make a new topic for this headline discussion, but as you mention it here I will confirm it. "Head line traverses the entire palm from one end to another. This is another very unusual sign and shows (potentially) a great intellect. This is one smart kid!" "He has long deep Head Line on both the palms of the hands. This shows he can and devote his mental powers to a great extent. This is a gift on his palms that indicates that the person's mind works like a super computer and that he is able to collect or huge amounts of data quickly or do parallel process efficiently. He is the grand synthesizer. He needs a job that is big, complicated and important. This gives the capacity to solve really big complex, complication problems and provide solutions. It is not necessary that this line would be found on the palms of famous people only. I believe this is a gift mark and could be found on any body’s palm, indicator of a brilliant, analytical mind, capable of solving tough real life problems." my first thought was "but I've seen many mentally handicapped people with very long head lines". I guess we need a new topic for discussion about this. (feel free to move my comments Martijn, as it is off-topic for this man's hand). I have also seen Sydney & simian & Hal 9000 lines on people with high IQ. I've also seen Sydney and Simian and Hal 9000 lines on people who have other mental handicap too. Accordingly, there cannot be any formula or link with the length of the Head Line and IQ or intelligence. As Line of Life has not much to do with the longevity of a person. We cannot declare a person mentally retarded or that he/she has Down’s syndrome on seeing only one sign on the palm. No sign is absolute in itself. There are or could be more typical hand characteristics in Down’s syndrome, like the presence of ‘simian line’ or a short square hand with small thumb and short or bent finger of Mercury shows clinodactyly along with ‘high positioned palmar axial triradii or a big degree angle of ATD , above 57 degree. A whorl at the Mount of Moon, abnormally all short fingers. Other symptoms found are the width of the palm is relatively large, very short fingernails are often seen. Sometimes the fingernails are very small. Other typical characteristics of the fingernail in Down's syndrome are: no lunula especially in the thumb nail besides having a ‘Sydney line’. I think a further deep study and research is needed having establishing new combinations with this line. Any serious student of this subject can work out innumerable combinations possible. One thing is necessary to remember that the Head Line reflects our mind and it is the thumb that decides the course of action and really a true palmist can value the importance of thumb in palmistry, on both the hands. Once again, I mention that try to establish combinations, once you have learned this then you will need no books of palmistry. I understand ‘Sydney line’ and Hal 9000. I used the word long and deep head line. I go with the Hand Analyst Richard Unger who highlights that sometimes the Sydney line may have a very positive outcome. At IIHA he developed a system of “Gift marking in your hand” and according to them a straighter Head Line is really a ‘gift’ marker No.12 and named as ‘the ‘Hal-9000’ This type of Head Line is very related to the Sydney line. In this case the Head line is very long but it does not reach the side of the palm at the Upper Mars. This indicates that a 'complete' Sydney line can not classify as a ‘gift marker’ as per IIHA study. The 'Hal 9000’is said to indicate presence of special multi-tasking capabilities in a person, such as an analytic brain and a talent for data collecting. According to IIHA the Gift marker 12 The Hal Head Line denotes a mega computer brain, a multitasker. Such people tend to be of strong characters, mentally fixed and physically tense. They'll easy become constipated, sleepless, or unable to eat properly. They are often talkative but emotionally not demonstrative. In spite of this they are great at coping with emotional difficulty. It is very difficult for them to relax. Restless they are. They can too easily ignore the demands of the body, instead digesting a planning or worry of a scheme. Yes, this is off the topic and Mr. Martijin is free to post it at more appropriate place. By the way, I have multiple sources of evidence available which indicate that a long head line (especially when it crosses the full palm - which is usually recognized as a Sydney line) does not correlate with high inteligence....."
2. I have worked as a part of world-class scientific (clinical) research teams for over 20 years. This is a very select sample of individuals and most of them could easily qualify for Mensa. I have many opportunities to look at the hands of these individuals, and indeed, there IS a fairly high correlation between their (presumably) super-high IQs and the frequency of long head lines. Of course, this is not a random sample, but in this case it does not have to be! 3. I have also worked in mental health profession for a number of years (Mental Retardation and Schizophrenia). Again, I am unable to state if MR is correlated with long head lines. Indeed, in the sample that I was privy to, I saw no correlation. What I did see was a preponderance of split head lines (the more profound the retardation, the higher the incidence) as well as a very high incidence of Simian lines. I am not sure if anyone has actually done any studies that correlated the degree of mental retardation with the incidence of abnormal palmar patterns. Perhaps you could shed some light on this issue. I am sure that your observation are true - actually, I have made likewise observations and I have presented them as data at my website. But beyond your observation... sorry, I can not support your conclusion taken from your observation. Simply because the data of various studies clearly indicates that there is (reversed) correlation between the Sydney line and intelligence. NOTICE: One can fundamentally understand this pattern by focussing on the fact that the Sydney line has been recognized by medical science as a 'minor physical anomaly' (just like the simian line!). But one has to consider the statistics of the occurences in the various IQ groups involved in order to see the pattern! Because else any incomplete observation/consideration could result in a delusion if not well considered; for example: any opportunist could conclude: "Oh... Tony Blair has a simian line in both hands... so the simian line must be a sign of intelligence!". But many academic studies have produced statistics related to simian lines among people with mental retardation - and these statistics highly contradict the opportunist's conclusion; the statistics tell a completely different story! Later this year I will probably be able to present new data based on an improved approach of the classification of the major hand lines (the PIC-model is rather complex because it adresses the combinations of various major hand line characteristics). PS. I will leave the topic of the 'long head line' here (I have shared my observations, and I am sure that we will get back to this topic in another discussion)... let's get back to the hands of Roshan. Your response gives me the impression that 'your estimate' is an intuition only - because in your words I can not find any detail regarding the foundation of your figures. One could easily wonder... what is the value of these figures? Did you ever create any data-pool on your samples of 'research teams' & 'mental retardation'? So far your words indicate to me that ... maybe you have made these analyses in your mind only? And how large are the samples that you have in mind anyway??? So, I think your figures raise more questions then answer. And from my experience... your estimate is actually... suspiciously high. From a scientific point of view I could easily qualify your estimate as 'unrealistic' in the perspective of the fact that IQ is a rather diffuse concept! Nevertheless.. I do agree that during a reading one should always try to consider the 'Gestalt' of a hand. But doing research basically requires a different approach... because one first really has to study the elements in isolation; and afterwards one can start considering certain 'Gestalts' of combinations! I hope this all makes sense.... but I am going to leave this topic in this discussion anyway. Let's get back to Roshan's hands!! The ability to directionally persistent of the mental faculties towards a single object is termed concentration. The degree of concentrative ability is determined by will; so, we must study the formation of thumb too while considering the mental ability in any sphere. Along with this, we must consider the patterns on the fingertips too, to determine the directional impulses influenced by mind or Head Line of course. Insane people do have Head Line but there mind does not remain in control. A Hal 9000 holder can make foolish mistake while a Sydney Line holder can save himself by not doing so, all due to the presence of other chirological signs, formations of hands, and lines on the hands. Give a person good normal head line and sufficient will and courage, he can do wonders and perform better than a Hal 9000 holder who has weak will. As a small Apollo line holder of a practical hand can create something out of nothing is better than the deep Apollo line with no courage or weak concentration or will. No sign on the palm is absolute in itself. The hand must be studied in totality. Here I am skeptic about research work. If you see some sign or mark on the palm try to find it somewhere on the palm to confirm. You will find one there the reason behind it. If such signs described by me are found only than you can say that the person will have to face the consequences of Sydney Line otherwise not. The slightest deviation from the normal conditions indicates certain qualities and tendencies. This is more important when we study the Head Line. Here utmost care is needed. I think I have been able to clarify what are my thoughts in this regard. Anyway, thank you for sharing your ideas. I think we can agree that Hrithik Roshan's head line can probably be described as a 'Hall 2000 head line' (in Richard Unger's vocabulary) - and not a Sydney line. And I fully support your words: 'no sign on the palm is absolute in itself'. As expected... a few days ago Hrithis Roshan's was statue was officially presented at Madame Tussauds. London, 22 January 2011: Hrithik Roshan became the fifth Bollywood star to have his wax statue unveiled at the world-famous Madame Tussauds museum in London. In homage to one of his most famous roles, he is portrayed in a short sleeved shirt left wide open to reveal his toned and taut body to full effect. Actor Hrithik Roshan spoke during an interview in London, January 20, 2011 after he unveiled his wax double at Madame Tussauds museum there. Hrithik fans abroad will at least get to pose with the statue even if the real star remains elusive! The figure took four months to make at a cost of 150,000 pounds and joins fellow Indian film stars Amitabh Bachan, Aishwarya Rai, Shah Rukh Khan and Salman Khan in the special Bollywood area. With a whole line of Bollywood stars the museum hopes to raise its profit with an increase in Indian and Asian tourist inflow. And... the wax statue of Hrithik Roshan indeed has his extra thumb! 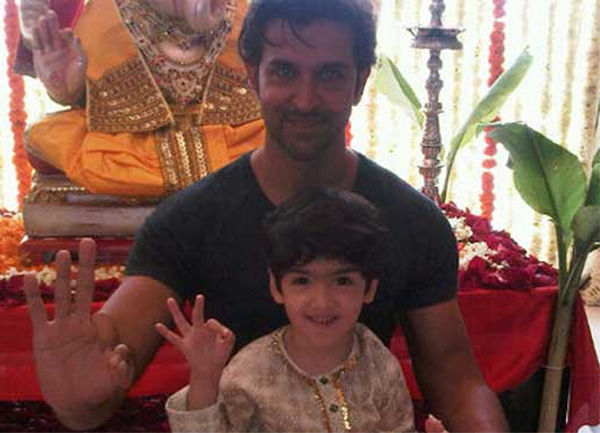 Hrithik Roshan & his Madame Tussauds twin brother... two 'double thumbs'! 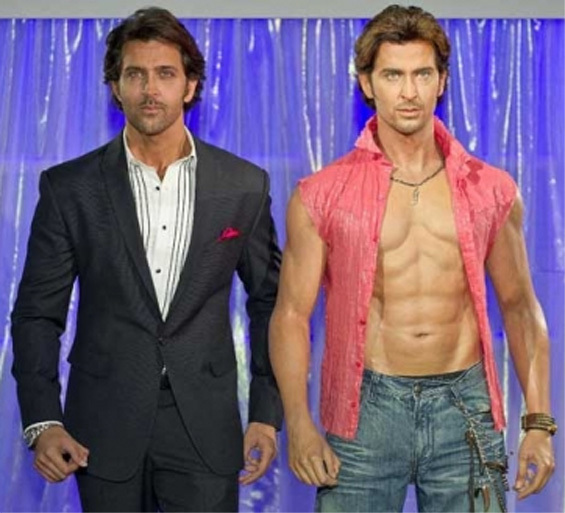 Hrithik Roshan & his Madame Tussauds twin brother: two 'double thumbs'... they look pretty cool! 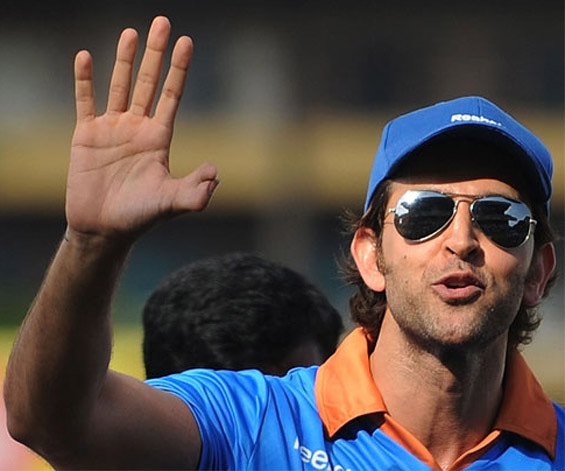 Hrithik Roshan's rigth thumb is probably one of the most fascinating thumb-shape variants ever seen on mankind; therefore this tribute to his thumb is now updated with a few more pictures: Hrithik Roshan's double thumb - a tribute! PS. Some of the new photos show that the inner thumb is very well shaped; however the outer thumb is smaller and has an irregularity at the nail. Yes I am big fan of Hrithic roshan and he is great actor and celebrity in the world.